Pete passed away last year on 29th June 2005. He was much loved and appreciated by the many friends he made during his years at Corsham, 1966-69. For those of us in his immediate sculpture group he offered an emphatic and highly persuasive literary dimension to the making of artefacts at a time when abstract and abstracted forms appeared to be in the ascendancy. Having previously gained an English degree at Aberystwyth, plus his self confessed total inability to draw in any way whatsoever, initially set him apart in a way. However Pete’s endearing manner and generous spirit, coupled with a dry sense of humour, and supported by a strong intellect, soon won us over. His work was indeed a breath of fresh air, full of wit, playfulness, and sometimes a little irreverence. After Corsham he spent most of his life in Cardiff where he continued to produce and sell his work both here and occasionally in the States. In recent months a couple of his friends have got together to produce a monograph in his memory. This book will be published in mid-November and costs £14.99. If you want to purchase a copy please contact Orian, either via email or 01970 615087. However, if you mention that you have read this information on the BAA Corsham website, then you will only have to pay £12 plus postage and packaging. 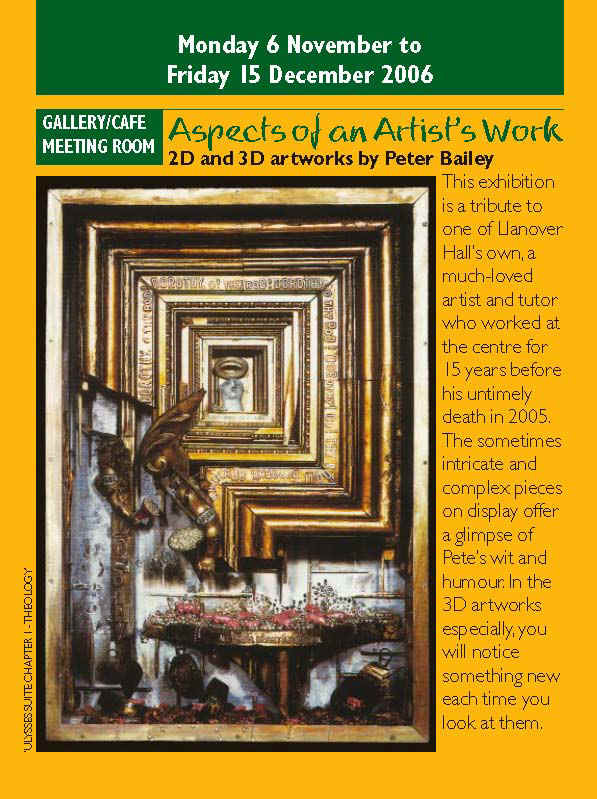 The Llanover Hall Arts Centre in Cardiff (02920 631144) has organised this exhibition of Pete’s work as a homage to him because he taught there for 15 yrs.